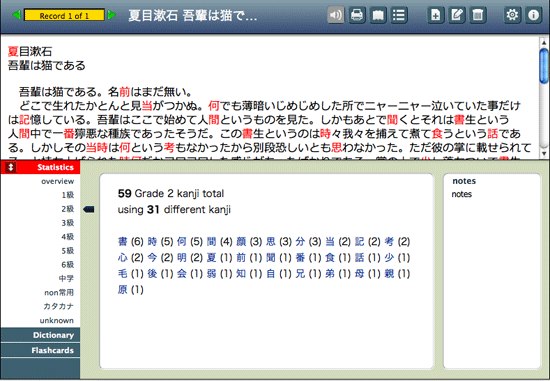 Another month another set of improvements to Kanji Sieve. In this release I concentrated on getting data in and out of the program. It is possible to import records from a previous version. As I strongly believe that the data belongs to the user it can all be exported in a variety of formats to be used elsewhere. You can use a built-in mini browser to search for texts at your favourite sites. Plain text and audio can be imported. I was hesitant about using Chuta online display. It was the only way at the moment to implement it for the PC. Chuta only stores a search for a limited time and while chuta is fast it does take a while to compile the custom page. I would prefer to work with cached data. What I do in the online display is check to see if the remote cache has expired and if it has fetch it again. It’s not ideal when loading the Chuta pane in the program but it is the best for now. I also had to sacrifice some screen real estate to get feedback that the program hadn’t frozen. After the first time your own cache should speed loading. Mac users can still work with the cached data by setting a preference. There are now several dictionary urls to chose from. I think jisho.org (denshi jisho) in a mobile phone version or risukun are the fastest and cleanest. Jim Breen’s wwwjdic is comprehensive but you need to pare down the interface via the preferences to avoid information overload and clutter. 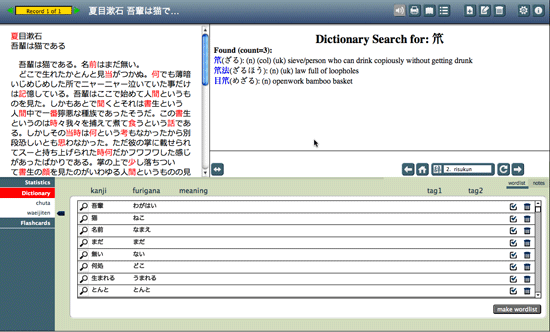 The Japanese dictionaries from Wordbank, Yahoo, Goo and ALC all have ads to a varying degree. ALC is the worst, which makes for a very cluttered window without expanding it. As I like to automate where I can you can submit a search just by clicking a button in the wordlist. You don’t have to type or copy and paste if you don’t want to. Owing to the imprecision of looking up words automatically you have to chose the correct version from the results and paste that into your wordlist yourself. I am happier with the PC version this time around. Overall I really think this is becoming a usable and useful tool. The online help is a work in progress. I will be writing it over the next month or so. After that it will be on to version 0.5 to release sometime in November. I´ve now checked out Kanji Sieve 0.4 on Windows XP sp3, Vista and Windows 7. All working perfectly. Have you had any thoughts on the possibility of changing user languages via .lng file etc. In the latest Diploma in Japanese Culture and Language course that I´m giving at one of our local universities, I´ve been trying out the old version of 2001 Kanji Odyssey (was called KanjiPower 555) for learning the first Kanji (I´ve translated most of it to Spanish html pages). Is there any way to include this Kanji data base in Kanji Sieve and have my students try it out as a study tool? (Additional to the jyouyou Kanji). Thanks for the input on how Windows looks. It all comes down to time. This is a hobby project rather than a commercial one. I haven’t forgotten non-English speaking users altogether. For v0.5 I am looking at some ways to use languages other than English. I’m trying to use icons and Japanese instead of English where I can. ( kanji [tab] Spanish keyword [return] ) I can either send you a custom version or include a preference to switch between English and Spanish on keywords. I need to release a bug fix this weekend / next week I could integrate it then. What specific data do you have? It’d be easier to integrate raw data rather than html files. v0.5 will have Kanji Notebook. I’m excited about the integration with the Statistics pane. At the very least I want the user to be able to input their own keywords if the given keyword doesn’t work for them. I glad you find it useful. Look out for v0.5 in November! Thanks for the reply. Latest Java version for windows is 6.0 update 21 (I´m using 6.0u19 and it is normally updated automatically). Great idea to label everything in Japanese and use small help pages for translations to other languages. For Kanji keywords in Spanish nothing better than the Kanjidic file in Spanish. Send me an e-mail from your preferred address to my address shown above and I´ll let you have the file by return. I also have other files in Spanish that I´ll also take a look at. For Kanji Odyssey/KanjiPower555 I can let you have a text version of the Kanji in numbered order of appearance in the programs. The idea is to use Kanji Sieve to show learnt Kanji from the KO/KP numbered list in Spanish just as you do it in English for grade levels. Let me know if you need it. Thanks for the great work. 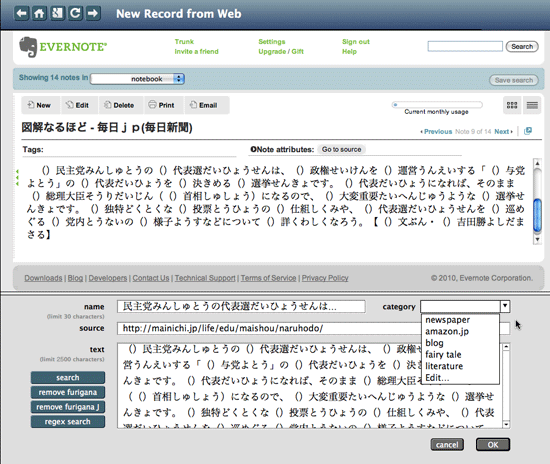 Looking forward to seeing version 0.5 with Kanji Notebook incorporated. The problem with Kanjidic is often extracting the information. Fortunately I wrote an XSLT to extract the Spanish keywords already back in May, and now have 2505 kanji with keywords in FileMaker format. I may do the same with other languages but at the moment I’ll concentrate on Spanish. I have to think about how to implement it. I’ve also found a web dictionary that will accept url-based queries which will help as well. Chuta has an option for Spanish but the returns I got were exceptionally sparse, sometimes only one word. Again I need to think about implementation. I think it would be through a custom filter pane in Statistics. A watch list of kanji, which in your students case would be KP555, for others a list from a textbook.